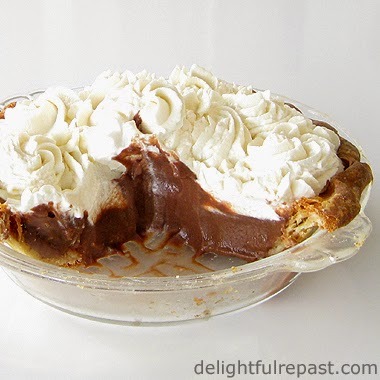 Chocolate Cream Pie is something I rarely have because a whole pie is too much for two or three people. Fruit pie I'll eat for breakfast, so no problem there. But chocolate, well, I can't justify having that for breakfast. Then I thought, Why not just make a small one? I had some leftover buttermilk recently, and you know how I hate to waste food. Happened to be making a pie one day and decided to use buttermilk instead of water. Loved it. And here I am again with buttermilk on hand, so I made buttermilk pastry for this pie. Thing is, I'm not sure I even like regular pie crust for chocolate cream pie any more. I'm thinking I might like some sort of crumb crust or maybe the nut crust I use on my Chocolate Creamy Dreamy. Subtitle: Some days it just doesn't pay to even go into the kitchen! Then there's the whipped cream. I'm thinking I might actually prefer meringue. But that might just be because I had such an ordeal with the whipped cream. Yes, an ordeal! The store was out of my favorite organic heavy whipping cream, so I got a different brand. It would not whip! I've never had that happen before. The heavy whipping cream was cold. The bowl was cold. The wire whip beater was cold. I made it just the way I always do. It would not whip! I always use number 5 on my mixer for whipped cream. After 10 minutes on number 5, the cream was barely thicker than when it came out of the carton. So I cranked it up to 8 for a few minutes. No change. I turned it all the way up to 12 for a few minutes. No change. I gave it 20 minutes total before deciding there was something wrong with the cream. My husband made an emergency run to the nearest grocery store and bought another pint of heavy whipping cream, and I started over. No problem, as you can see from the photo. Question: Ever happen to you? Or: What is your latest kitchen fiasco? Update 08/30/16: If you're making the pie ahead and want to make sure the whipped cream holds up, follow the directions here for Stabilized Whipped Cream. 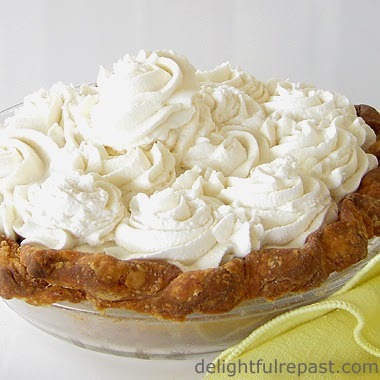 Update 02/01/19: My new favorite crust for any cream pie is the one you will find here at Banana Cream Pie - Best Crust Ever for Cream Pies. 1 In 1.5-quart bowl, whisk together flour and salt. With pastry cutter or fingertips, cut butter into flour, leaving some larger pieces. With a dinner fork, stir in buttermilk a little at a time, using only as much as necessary to form a shaggy dough. Wrap the dough in a square of plastic wrap, forming the dough into a 1-inch-thick disk. Refrigerate for 30 to 60 minutes. Save the piece of plastic, you'll be using it again. 2 Roll out pastry to an 11-inch circle and transfer dough to 6- to 7-inch pie plate, pressing dough (but not stretching it) to fit pie plate with about a one-inch overhang (trim with knife or scissors), crimp edge, cover with reserved piece of plastic wrap and chill in the freezer for 20 minutes, dock (poke holes all over bottom and sides with a fork). Preheat oven to 400 degrees. Bake for about 25 to 30 minutes, until well browned. Cool on wire rack. 3 When pie shell is just about cooled, start making filling. In heavy-bottomed 1.5-quart saucepan, whisk together sugar, cocoa, cornstarch and salt. Whisk in egg yolks, coffee and, gradually, milk until smooth. Cook over medium-high heat, whisking constantly, until you see bubbles forming at the edge and the mixture thickening, about 5 minutes or so. 4 Strain through fine-mesh sieve, and stir in butter and vanilla. Pour into cooled crust and smooth top. Cover with reserved piece of plastic wrap and let cool at room temperature for one hour; place in refrigerator for at least 3 hours or overnight. 5 In bowl of heavy-duty stand mixer with wire whisk attached, beat cold cream, sugar and vanilla on medium speed. After about 4 or 5 minutes of thinking nothing is happening, you'll start to see the cream thickening. Continue to beat at medium speed, watching for the soft peaks stage, then the firm peaks stage. If you're just spreading the whipped cream on the pie, stop there. If you want to pipe the whipped cream, beat until whites hold stiff peaks. Pay close attention at every stage; it can turn to butter before you know it! 6 With a pastry bag fitted with a 2D tip or 1M tip, pipe rosettes of whipped cream onto pie. Thank you. "Dreadfully" good - I like that! Must use it. Thanks for the ranch info, too. That pie looks soooo good! I may have to add that to my Thanksgiving desserts. And yes, many years ago I had the same experience with whipped cream. I kept thinking, "just a few more minutes" and I kept whipping and whipping until finally, I gave up. I can't even imagine what would cause that. Susan, thanks! Someone suggested the cream was too fresh, someone else that it was not fresh enough -- I hope *some*one can tell us! I "whipped" up some cream this afternoon, omgoodness, it took forever, I started to think it would never happen. It did but it's funny because I don't remember it ever taking that long!! Thanks, Debbie! AND thanks for permission to have it for breakfast! Stephanie, thank you! And the French will call a chocolate croissant and a cup of coffee breakfast! Jacqueline, sometimes you sound more Scottish (wee) than The Great Scot! :D I rarely use gelatin, so can't recall any problem with it. I giggled because NO PIE IS EVER BIG ENOUGH!!! lol Seriously, small is good because we would not be tempted to eat too much! Have a lovely day, Jean. Mildred, thank you. I hope you are mending and will be back on your feet soon. And, in view of what you said about no pie being big enough, I think today I'll bake a slab pie of some sort! Judy, I used to feel that way about meringue. Then I discovered it was only *other people's* meringue I didn't like! So many people put way too much sugar in it and it's just sickening. Oh my goodness! I want some! I am going to try your crust recipe for sure! I think chocolate pie for breakfast is A-OK! Thanks, Pom Pom! Let me know how it turns out for you. Nicole, thank you! 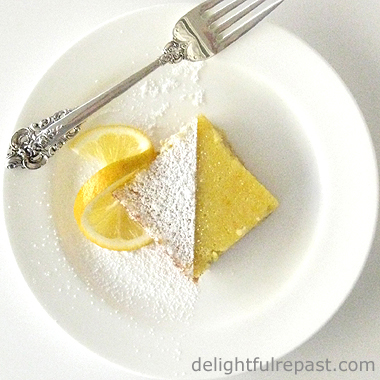 I love recipes that remind us of our grandmothers! Hope making this will stir up lots of grand memories for you. Sully, we are actually in agreement here. I think that's exactly it -- the combo of pie crust and chocolate just doesn't work for me anymore. But the crumb crust or nut crust, yes. This pie is perfect in every sense. The golden crumbly crust, decadently smooth chocolate filling and that wonderfully whipped fresh cream...a heavenly treat, Jean. Thanks, Angie! I do love the contrasting textures of the pie, now that you describe them so beautifully! Your chocolate cream pie looks delicious! Pinning! Thanks, Michelle! Your cookie exchange fiasco gave me my first big laugh of the day! Glad your husband can bake, huh? Reminded me of the time my sister made two pumpkin pies and left out the sugar. Made her really mad because she did not enjoy cooking and it had been a real struggle for her to make those pies. Fortunately, my brother stopped her as she was throwing them in the garbage, and he just poured sugar on top of them and ate them! I LOVE chocolate cream pie. My grandmother use to make it for me every time I visited. She also made banana cream pies and one day I asked her to make a two layer pie with both. Yum. I don't have my grandmothers recipe and she's gone now so I might just have to make yours, which looks simply dreamy! Oh and yes, yes, yes to the whipping cream! Thanks, Richard. I love grandmother stories. Hope you'll make this soon and that it will be almost, but not quite, as good as hers! Greg, I like it because then there's no waste, and that's one of my goals. Which always makes me think of my very "sensible" grandmother! I always end up tossing half of all the desserts I make because it's too much for the two of us. Brilliant idea! Thank you, Maureen! With some pies, I freeze half and they're fine. But some pies just don't freeze well, so one of these little half-pies is just right for us. Oh my, this pie does look delicious. And I love chocolate.. Thanks for sharing the recipe.. Have a happy weekend! Thanks, Eileen! I think smooth and creamy chocolate things are better "comfort food" than other textures. Hi again Jean! How's it going? I've never seen a chocolate cream pie in real life before (or even in photo). I thought it was a made up thing that only existed in cartoons because the idea of having a pie which is literally just chocolate and cream seems ridiculously decadent, but now I see it's actually a "real thing", and my day just got little bit better - no word of a lie! It looks delicious - wonderful looking crust too. As for your question about the cream - My mother in law had that problem once. She bought the store's own brand of whipping cream, which is like 38% fat content or something, where she normally buys a name-brand, which is 40% fat. Apparently it took ages to get even a loose whip. Amazing the difference a bit of fat can have. I also had the problem for the longest time when I lived in France because I was buying something called "whole cream" and trying to whip it (nope!). I didn't know for the longest time that I should have been buying something called "crème fleurette" :p.
Wow, Charles! No chocolate cream pie? It's about time you had one! Let me know how you like it! Thanks for telling me about your MIL's whipping cream experience. I also heard that it could be caused by temperature fluctuations during the shipping process or the grocery store's handling of it. Finicky! Thanks so much, April! "Hearth and Soul" -- I love the sound of that! Thanks, Michael. I had that impression (that you like chocolate)! Hope you'll make one of these soon. Sigh...... I have been known to eat chocolate for breakfast...... I like the idea of making a small one, and yours looks absolutely gorgeous. Sara, thanks! I hope you'll make it soon for a nice chocolatey breakfast! what a perfect treat for just my hubby and me! Love this! Thanks for sharing a lovely treat for a Chocolate Lovers Link Pary at Celebrate 365 Blog Party! Thanks, Jan! And thanks for hosting the blog party.